We’re happy to announce that we’ve completely rewritten our MasjidNow iOS application from the ground up to use newer technologies and redesign the user interface. Mobile apps have come a long way since we first wrote the app in 2013, and we decided that it was time to move on from our old structure and embrace a more modern look and feel. Our new, improved prayer times screen. Not only have we improved the design and look and feel of the app, but we’ve also made it quicker and more responsive, and easier to find all of our features. Author masjidnowPosted on March 12, 2016 Leave a comment on Newly designed iOS app! MasjidNow has now enabled the safety and security of HTTPS (an encrypted connection) for all of our pages. When you visit any page on our site, whether it’s your Masjid User Account page, or your mosque’s MasjidNow profile page, you’ll notice that your connection to our website is secure. Google Chrome shows the “green lock” icon next to the URL when a website is secured by HTTPS. This new enhancement now enables secure communication when using all pages of our site. Author masjidnowPosted on March 16, 2015 Leave a comment on MasjidNow is now safer and more secure. Travelling while Muslim can be quite a hassle – especially when it comes to knowing the local prayer times. That’s why our latest updates to Muslim Azan and Prayer Times (MasjidNow) for Android now includes Auto Location updates. There’s no need to turn on anything or check any boxes – the location updates are automatically enabled and will run in the background, using the latest Android features to minimize unnecessary battery use. When a location is detected, your timings will automatically be adjusted and your widgets (if you are using the Pro version of the app) will instantly display the new location’s timings. You can download the latest update to the Android apps from the Google Play Store by searching “MasjidNow” (make sure it is one word). We recently upgraded the look and feel of prayer timings editor on our website. We felt that the editor page was confusing for new users, and gave off an “information overload” vibe. We recently discovered that it was missing a tiny bit of key information as well. Each month now has easy to see separators for weeks, since we know many mosques have different timings for the weekend vs the week, or special timings on Friday. For example, Houghton Masjid near Johannesburg, South Africa, one of our first customers, has different Dhuhr timings on the weekends as compared to Monday – Thursday. We also made some changes to how the salah names show in the editor. Before, the headings were visible above every row. We decided that this was a waste of valuable space and contributed to the overall “complicated” look of the editor. Now we only show the headers before each Monday of the month. Finally, we realized that the day of the week wasn’t shown for each day – that has been fixed as well. Although these changes seem minimal, we hope this makes editing and saving prayer timings for your masjid even faster and easier. All of our users can now enjoy the updated editor. If you have any suggestions as to how we can further improve the editor, be sure to email us using the contact form on our website. 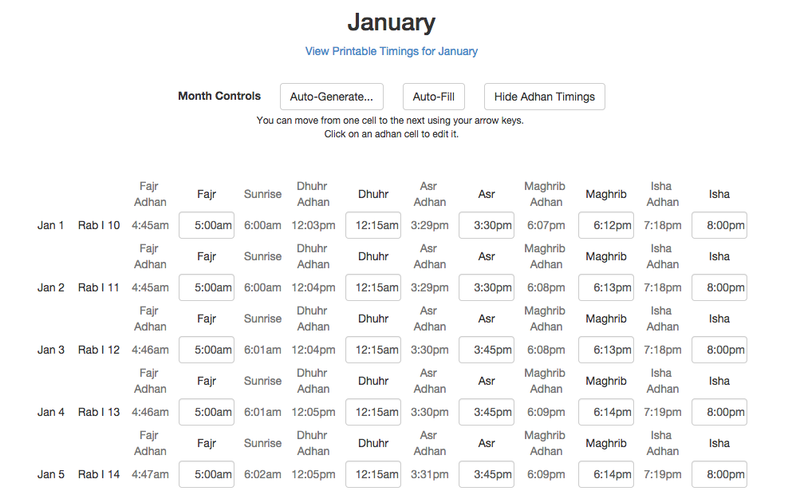 If you are not yet a MasjidNow user, you can sign up for free and create a prayer timings sheet for your mosque now. 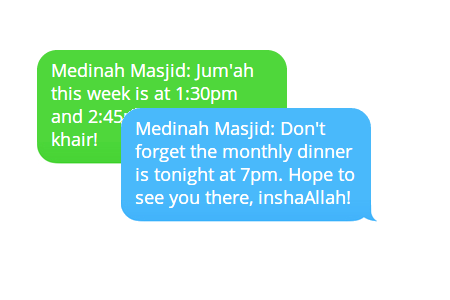 At MasjidNow, we are always trying to make saving prayer times easier for our users. That’s why we recently introduced the brand new “Auto-Generate” feature of MasjidNow, the fastest way to create timings we’ve ever built. Auto-Generate works by first calculating adhan timings for your mosque, based on its location and the calculation settings you choose. 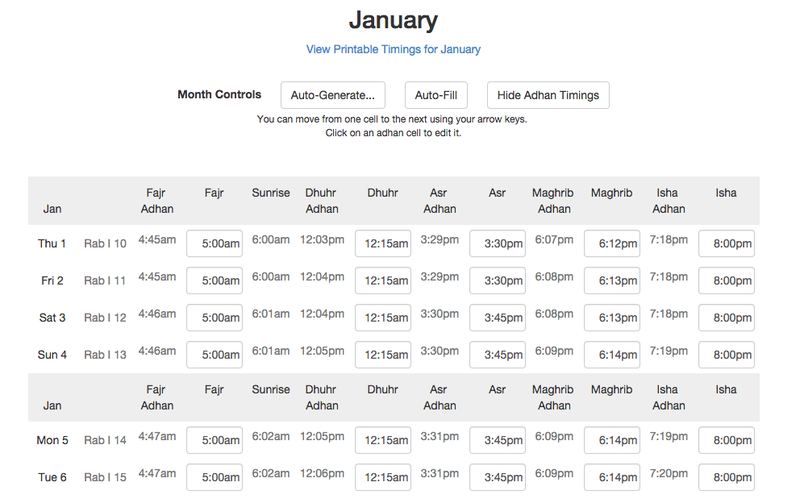 Then, using those timings, and a set of rules that you enter, our software figures out the best timings for each and every salah in the given month. 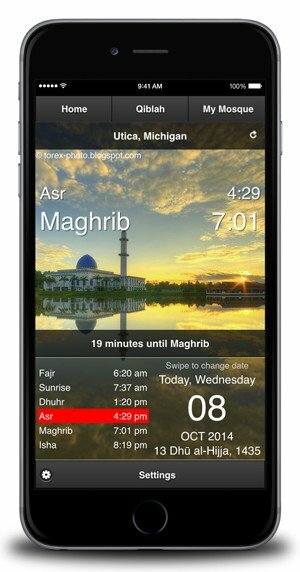 For example, many of our users’ mosques have the jamaat timing for Maghrib exactly 5 minutes after sunset (ie. Maghrib adhan). 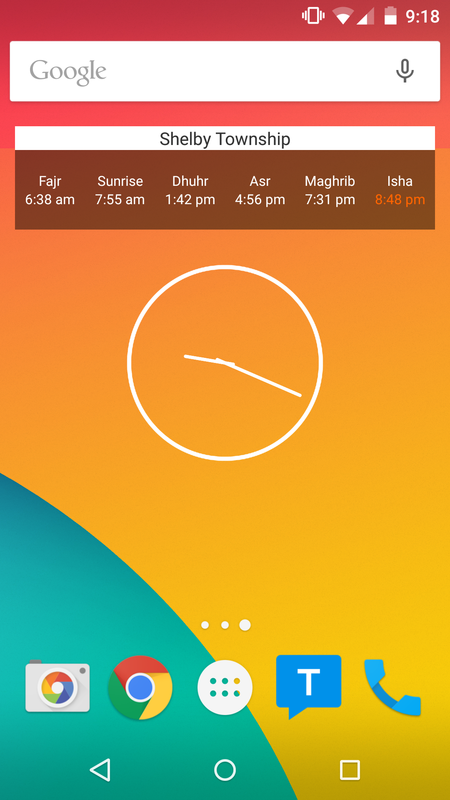 Using our Auto-Generate feature, our application will fill in the Maghrib Iqama/Jamaat time for the entire month by taking the calculated time for Maghrib and adding 5 minutes to it. There are also other choices that you can make when generating a time. Instead of just adding 5 minutes to the calculated time, you can also ask the algorithm to find the closest “even” time. For example, if your masjid always rounds the adhan time up to the nearest 10 minute mark, then you can ask the software to do that as well. If you have a calculated Dhuhr Adhan time of 1:13pm, pressing “Auto-Generate” after choosing “Nearest :10 minute mark” would generate a timing of 1:20pm for Iqamah. The software will generate timings for the entire month with just one click. This extremely powerful method of creating time tables allows you to generate timings for entire months in just a few seconds. Existing users can find the new feature on their “Edit Timings” page, and new users can sign up for MasjidNow and get an app for their masjid instantly. We hope that you enjoy using our new features, and as always, you can email us if you have any questions or comments – or use the comments section below. Like any charitable or non-profit organization, masajid (mosques) are always looking to save money. That’s why we at MasjidNow are always looking for ways to help our customers save money on our service, while still being able to receive first-class support and products. Starting today, any of our existing paid subscribers can begin to earn entire months of our service for free – by simply referring other mosques to use our service. MasjidNow Referrals are now available from your user dashboard. Any paying subscriber of our service can participate in our Referral Program. SImply visit your user profile and click on “Refer A Masjid” to get to your referrals dashboard. You can either email your referrals right from our website, or simply copy and paste your referral link to Facebook, Twitter, or in an email to another webmaster. The referral emails and your referral link contain a special code that is unique to your account: when someone visits our site by clicking your link or through your email, the referral will automatically be assigned to your account. Once a mosque signs up for MasjidNow using your referral code, you can track their progress in your Referral Dashboard. You’ll be able to see when they’ve signed up, if they have started their free trial, and if they purchase a paid subscription. Both you and the referred masjid will benefit when he/she purchases a subscription. No matter what plan you are on, you will receive a month’s cost off of your next bill. This also applies to mosques who purchase a full year at a time, for even more savings. For example, if a masjid has purchased the $9/month plan, and they receive a referral discount, their next bill will be for $0. But if they had purchased a $99/year plan (and received a month free for that) they will receive *another* $9 off. The mosque that you refer will also receieve a month free *in addition to* their free trial of MasijdNow. There are no limits! You can refer as many mosques as you want to our service, and when any of your referrals sign up for a paid subscription, you’ll continue receiving free months. We don’t cap the number of free months you’ll receive. You can both help your mosque save money and also help the mosques you refer save money. It’s a win for both parties, and inshaAllah can be a source of benefit for everyone. If you have any questions, you can contact us from our support page. Importing jamaat and adhan timings to your mosque’s website can be a time-consuming and difficult process. Even with MasjidNow’s relatively painless copy-paste timings feature, there were still sometimes issues with timings being not imported correctly. To remedy this problem, and make it *even easier* to save your jamat (congregation) timings to MasjidNow, we created a new feature: Timings Spreadsheet Import. It is immediately available to all of our registered mosques. Simply download the provided timings template file, and add your adhan and iqamah timings to the proper columns. 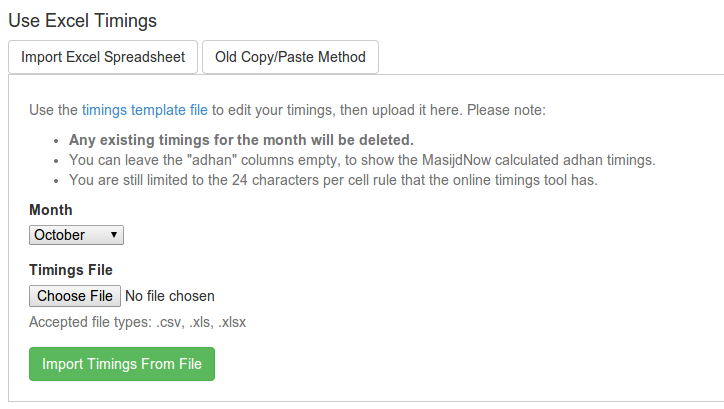 Then, visit the “Edit Timings” page of your MasjidNow account, and upload your mosque’s prayer times in an instant. You can still adjust the timings once they’ve been imported, as well as add monthly information and customize the hijri date as you’re used to. Of course, the timings and information will immediately be available on your mosque’s website, and our prayer timings apps. Existing users can sign in to their mosque account and download the prayer timings template from their masjid’s “Edit Timings” page. If you aren’t a user of MasjidNow, what are you waiting for? Sign up for a free masjid account now, and get your prayer timings and mosque information on our mobile apps, your website, and MasjidNow’s global mosque database. Over a year ago, we created a WordPress plugin for mosques that wanted to display their MasjidNow times on their WordPress websites. MasjidNow was delivering timings in the best way possible. We also received many requests for a timings plugin for non-WordPress installations – sites that used Joomla!, DotNetNuke, Drupal, etc. Unfortunately, we didn’t have enough resources to keep plugins up-to-date for all of these different frameworks. Until now. Introducing our new HTML Embed code – designed to work with any website! You can use our handy embed code generator to create the embed code for your mosque. There are all sorts of options you can fiddle with, too, with many more coming soon, inshaAllah. Just press `Generate` when you’re done, and you can copy and paste the created code anywhere on your website that accepts HTML. You’ll also see a live preview of what the widget will look like on your website – don’t worry, it will adapt to the color scheme of your website too. 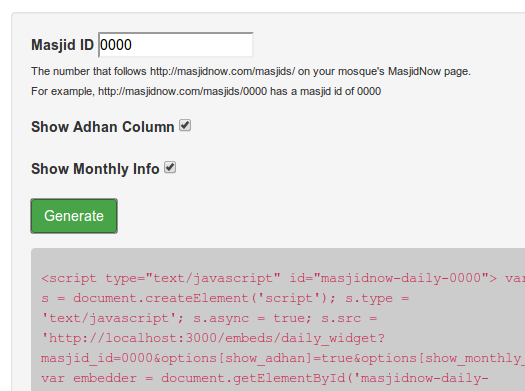 We hope this will help our customers who don’t have WordPress websites expand to using our MasjidNow services. Suggestions, questions, or comments? Let us know what you think in the comments section below. Announcing New Features for MasjidNow! As we mentioned in an earlier post, we’ve recently added new features to our MasjidNow service. These features include Ad Block, Push Messaging, and the Timings Sheet Save service. Read on below to find out about each feature and it’s benefits for you! Author masjidnowPosted on September 22, 2014 Leave a comment on Announcing New Features for MasjidNow! 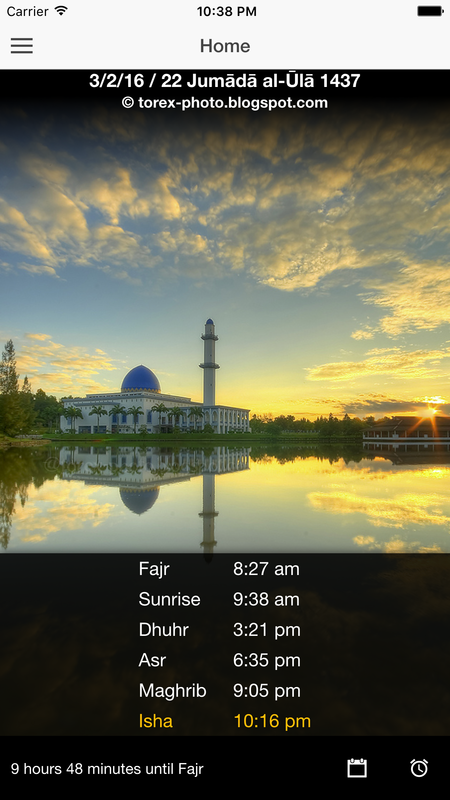 We are now proud to announce new features as well as new pricing for our prayer timings service.